NOT surprising. 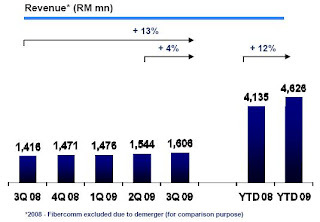 Celcom (Malaysia) Bhd, the country's second largest mobile operator, is out performing its peers over the past quarters, especially during the economic slowdown. For the 14th consecutive quarter, it posted revenue growth on a quarter-on-quarter basis. 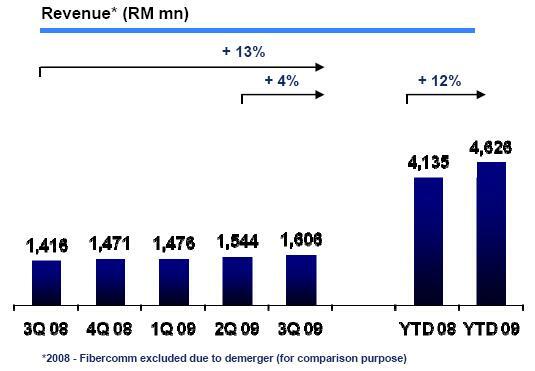 Even DiGi.Com Bhd couldn't do that. DiGi may have posted consecutive year-on-year growth, but definitely has not posted Q-on-Q growth (yet). 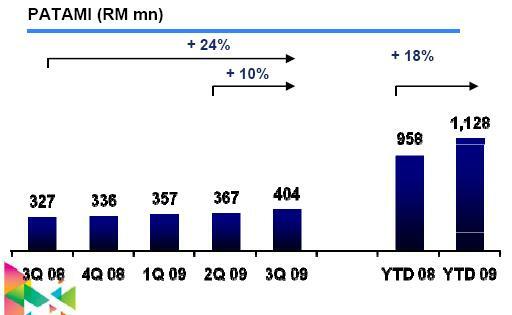 Besides sales, its bottom-line has also registered Q-on-Q growth. Its Ebitda margin has also improved slightly against second quarter, but overall, still slightly lower than what it recorded last year. Last but not least, its subscriber base. It has for the first time exceeded the 10 million mark. It recorded a net additions of 444,000 customers last month (net additions: new customers minus customers who left). Of which, 130,000 are new postpaid customers and 314,000 are prepaid customers.